Please excuse this "filler" post: My browser is starting to get overloaded with open tabs that I haven't yet used but want to keep handy. Maybe you'll find them useful and/or informational, too. David B. Kopel has a two-part series about the "assault weapon" hoax over at Reason. A reprint of a 19th century essay by Frédéric Bastiat: The Law. Open Letter to Virtue Signaling Gun Grabber. Highly quotable. Another series, this time by BJ Campbell at Medium. Everybody's Lying About the Link Between Gun Ownership and Homicide. In a nutshell, it's the "gun death" vs. "gun homicide" argument — how "gun deaths" inflates the numbers by including suicides-by-firearm — fleshed out with examples and graphs and real statistical analysis. The Left is Making the Wrong Case on Gun Deaths. Here's a Better Case. Basically, since 2/3 of "gun deaths" are suicides, helping suicidal people will do more to reduce "gun death" numbers than any other single effort. The Gun Homicide Epidemic Isn't. Explores, among other things, public perception of violent crime rates — the public believes crime is going up, but the numbers say otherwise. Money quote: "What we really have, is not an epidemic of homicides, but an epidemic of news stories about homicides." NRA-ILA on Oregon Ballot Initiative to ban "assault weapons" and "large capacity magazines". Jesse Kelly at The Federalist: Why a Good Father Prepares His Sons for War. Interesting read, and not for the reasons the title implies. Sultan Knish: Who Runs March For Our Lives? As always, follow the money. Daniel Greenfield does, and as you might have guessed, it's not "organized and led by students from Marjorie Stoneman Douglas High School". Sarah Hoyt, writing at PJ Media: Of Laws And Men. Challenging the "There ought to be a law" crowd. We now have a ballot measure number for the proposed ban on "assault weapons" and standard-capacity magazines I wrote about in my last post. grenade launcher or flare launcher. "Assault weapon" ALSO includes semiautomatic pistols and semiautomatic (centerfire AND rimfire) rifles with fixed magazines that can accept more than 10 rounds of ammunition (IF I'm reading this as graciously as possible); semiautomatic, centerfire rifles with an overall length less than 30 inches; semiautomatic pistols that accept detachable magazines and have any of features #2, #3, or #4 listed above, or can accept a detachable magazine outside the pistol grip, or has a "threaded barrel capable of accepting a flash suppressor or forward pistol grip". "Assault weapon" ALSO includes semiautomatic shotguns that have a pistol grip and folding or telescoping stock; or have a fixed magazine that holds more than 10 rounds, or can accept a detachable magazine; or has a revolving cylinder. "Assault weapon" ALSO includes any "conversion kit, part or combination of parts from which an assault weapon can be assembled if those parts are in the possession of under control of the same person." Defines "large capacity magazine" as "any ammunition feeding device with the capacity to accept more than 10 rounds or any conversion kit or combination of parts from which such a device can be assembled". They graciously provide an exception for magazines permanently altered to hold less than 10 rounds, .22 caliber tubular magazines, and tubular magazines contained in lever-action firearms. Makes possession of an unregistered "assault weapon" or "large capacity magazine" a Class B Felony. Yes, mere possession of an unregistered inanimate object will be punishable the same as first-degree aggravated assault! And that's not even getting into the fact that magazines typically aren't manufactured with unique serial numbers. What will they register? Also, there are no exemptions for .22 caliber firearms, which means that your Ruger 10/22 is now an "assault weapon"; it's semi-automatic, uses a detachable magazine, and has a section of the stock that wraps around the underside of the barrel, or in other words, "partially ... encircles the barrel, allowing the bearer to hold the firearm with the non-trigger hand without being burned". Yes, this wording basically bans ALL semiautomatic rifles, and many semiautomatic handguns and shotguns, and makes no exceptions for caliber or historical significance. M1 Garands and M1 Carbines would be covered, as well as semiautomatic M14 clones. So would the "Broomhandle" Mauser C96, since its magazine inserts forward of the trigger and not in the grip. And yes, this wording bans any pistols you have with threaded barrels for sound suppressors, since if it's threaded for a suppressor it's capable of accepting a flash suppressor. Even if you don't have one. Even no such device exists for your model of pistol. Honestly, I'm surprised they didn't go for a .50-caliber ban. A person seeking to register an "assault weapon" or "large capacity magazine" must also "submit evidence satisfactory to the Department [of State Police] to establish that" such items are stored "securely ... pursuant to existing law and ... as provided in any rules and regulations adopted by the Department specifically relating to assault weapons and large capacity magazines". Here's the kicker: There currently is no "safe storage" law or statute in Oregon. This would allow the State Police to not only create "safe storage" rules and regulations from whole cloth, but also force you to comply with them before you are eligible to register your private property. Personally, I believe this is a "due process" violation, as you would be required to prove your innocence before being found in compliance. It is also a Fifth Amendment violation, as attempting to register (as required by law) potentially requires you to self-incriminate about what a nameless somebody in the State Police might consider a "safe storage" violation. Also included in that "submit evidence satisfactory to the Department" clause, an owner of an "assault weapon" or "large capacity magazine" may only possess them on their own property, on others' property only with the express permission of the owner (and must be securely stored; so forget carrying your concealed handgun with your "large capacity magazine" in public), on the premises of a licensed firearm dealer or gunsmith, at a "legal gun range" (though this term is used in several places, it is not legally defined anywhere in ORS), at a firearms competition or exhibition, or while transporting between these "approved" places. You may not sell or transfer your registered private property, except to a licensed dealer or gunsmith for repair. You may not ever purchase another "assault weapon" or "large capacity magazine". You must report the loss or theft of an "assault weapon" or "large capacity magazine" within 48 hours of the discovery of loss or theft. Right now, it's in the first stage of the referendum process, gathering sponsorship signatures. They only need 1,000 for this — that should be a breeze in ultra-"Progressive" Portland(ia) — so expect that to happen quickly. Then the state's Attorney General will draft an "impartial title" for the measure (if there is such a thing for this type of measure). After that comes the big petition drive. Since this is a petition for a statutory change and not a constitutional change, the threshold to get it on the ballot is lower: 6% of the number of votes in the last gubernatorial election, or 88,184 signatures. Again, in uber-liberal Portland(ia), that shouldn't be too hard, especially if they mislead prospective signers on the effects of the bill — which they will; giving the (probably undeserved) benefit of doubt, I'm not entirely sure they realize themselves what they're proposing. The advice from the last post still applies: wake up every gun owner you know, get them registered to vote if they aren't already, and implore them to vote "No" on this monster. Oregon is a 100% absentee voting state, so all most of them have to do is mark "No" and mail the ballot. Should be easy peasy, but it's going to take all hands on deck come election day. Even better, though, would be if we build up a large group of pro-gun activists to reach out to non-gun-owners and get THEM to vote against it, too. If we're going to beat this thing, we CANNOT let a small minority try to carry all the burden for the rest. My next project will be to come up with photos of firearms they want people to think they're targeting, versus what's actually covered, and circulate the comparison as a meme. It'll post here first. Anti civil rights groups are meeting tonight to launch a ballot measure to ban modern firearms and feeding devices. At this point, they're probably just starting to gather petition signatures. But if they get enough — and let's be realistic, they will — it will go to a general vote. As OFF notes, ballot fights in Oregon are typically won in Multnomah County; it's the population center of Portland(ia) and carries WAY above its weight in (blue) votes. No doubt that's why the anti-gun groups are choosing a ballot initiative fight versus petitioning the Legislature; they think they can get more restrictions more easily. The worst part is: historically, they're not wrong. The counter-solution is to Get Out the (Non-Urban) Vote. We will need to engage all gun owners for this one. If you're registered to vote in Oregon, make sure you cast your ballot. If you're not registered, get registered. And if you know any gun owners who aren't registered, offer to take them down to get registered. We're going to need everyone on board. I'm not going to bull-s**t you, it's an uphill battle we're not likely to win. My biggest hope is that since this is an off-year election, the Multnomah County liberals won't feel like putting in the effort. Don't count on that, though; I fully expect money to flow freely from out-of-state anti-gun billionaires to fund advertisements in support of the measure. The pro-gun side will not be able to match those resources. ... especially since Oregon votes 100% absentee. You can stay home and still vote; there's no excuse for failing to mail your ballot. I'll post an update as soon as the signature-gathering is complete and we have a measure number. *tap tap* Is this thing still on? Yes? OK.
My apologies to our dear readers for the lack of content. Life tends to interfere with blogging, and when life speaks louder, you have to listen or get left behind. My thoughts are not yet collected on the school shooting in Parkland, Florida. Every time I turn on the news, it seems, the narrative has changed again, the "authorities" appear even more amateurish, and the "children" are even more exploited by the media. It's painful to watch, really. So instead, today we'll visit our old friend and resident Oregon anti-gunner, Jason Kilgore, a.k.a. "Baldr Odinson". He's had quite a lot to say about the Parkland shooting, little of it accurate or true (he IS an anti-gunner, after all). One recent post in particular, however, needs some fisking fact-checking, as he's (intentionally) omitting certain very-important truths. Let's get started below the fold. As always, his words will be in block-quoted italics, and most of his links will be omitted. There is so much we need to be thankful for. Most of all, for the Shining City on the Hill that is America. This country continues to be the last, best hope of mankind and we should treasure the positive impact it has made on the world's condition. MSNBC’s “Morning Joe” co-host Mika Brzezinski said Monday on the show that supporters of the Second Amendment who don’t want to talk about gun control in the wake of Sunday’s mass Texas church shooting are “cowards” — even though two armed Texans reportedly chased the gunman down. I am a Second Amendment supporter who is perfectly willing to talk about "gun control" after the atrocity in Sutherland Springs, Texas. Contrary to what you seem to believe, I'm not alone, either. There are many, MANY of us out here. But you and your boy-toy, Joe Scarborough, will never allow me — or any of us, for that matter — on your show. Hell, I doubt either of you would even be willing to post anonymous comments here. Is it because you know, deep in your two-sizes-too-small hearts, that the pro-Second-Amendment side of this conversation has facts, evidence, scholarly research, and SCOTUS decisions supporting our point of view, while you have name-calling? Is it because you don't want to be intellectually trounced challenged on national television? Is your self-styled public image as the all-knowing moral compass of America too delicate to risk in a real, honest-to-God unscripted dialogue? You said, "Like exactly when can we have this conversation? You're cowards." Let me make this absolutely clear: We're having this conversation right now. We've been having this conversation for upwards of 30 years! We have it again after every terrorist attack and after every time some disaffected loser decides to take out his perceived personal grievances on innocent victims! Every. Single. Time! We never stop having this conversation, because there is always someone like you who says our rights should be restricted and we need to have a conversation. Here's the truth, whether you choose to see it or not: The conversation has been happening all around you. You have just never truly participated. And I for one resent being called a coward, when you choose to not participate directly in that conversation you claim you want to have, and which I have been actively engaging in for years. So any time you feel like you want to have that conversation — REALLY have that conversation, with someone who talks back — feel free to drop by and leave a comment. Hit up my e-mail (it's right up there in the upper-right corner of the blog), and we'll talk. I'll even be polite and not resort to name-calling and/or histrionic wailing! But you'd better bring your A-game, because I will be quoting SCOTUS, citing rigorous scholarly research, using logic and reason, and bringing facts and truths you may find inconvenient and prefer to ignore. Until then, you can keep your self-deluded moral supremacy to yourself. There's a lot of noise coming out about NFL players "protesting" the National Anthem by either "taking a knee" instead of standing, or staying in the locker room instead of being on the field. A lot of great minds have weighed in on this, and even though I'm a bit late to the game (no pun intended), I have a few thoughts to share. The first "protester" was quarterback Colin Kaepernick, formerly of the San Francisco 49ers and currently a free agent, who remained seated during the National Anthem last year, to protest racial oppression and mistreatment of "people of color" by police. Since then, other players have joined in, kneeling "in solidarity". This year, President Donald Trump weighed in during a rally in Alabama, saying in part [edited for language], "Wouldn’t you love to see one of these NFL owners, when somebody disrespects our flag, to say, 'Get that son of a b***h off the field right now, out, he’s fired. He’s fired!'" Currently, whole teams are kneeling or retreating to the locker room during the National Anthem, and the "protest" against racial injustice has become synonymous with anti-Trump rhetoric. Anybody out there ever hear of a Mr. Jake Mace, of Phoenix Longevity Arts? I recently ran across his YouTube channel, and as a practitioner of martial arts I found myself enjoying his take on techniques I know (usually by a different name) and learning a few new things, too. Unfortunately, he has an "opinion about guns", too. Hey, everybody, it's Jake Mace, with JakeMace.com. During meditation, my unconscious mind and the universe send me thoughts sometimes, and I wanted to share with you guys one of these thoughts today. I live in the U.S.A. and a lot of people around me — friends, and family members — they own guns, and they use guns. A lot of them have guns, but they don't use guns; they just feel safe having a gun in the house protecting them — "protecting them". 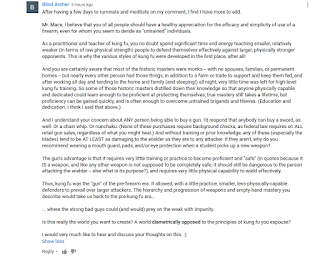 And the way that I've always thought about guns, comes from the path of a martial artist, Chinese kung fu and tai chi guy, who thinks about guns like he thinks about any other weapon in the martial arts. And so when I have brand new students join my program, they first learn empty-hand skills, of some grappling and some striking, some fitness, conditioning, breathing, meditation, and stance work. And then once they have that down they go on to the bo staff. The bo staff is the first weapon that they learn how to use, and you guys have been getting our bo staff DVD and bo staff from JakeMace.com. Once they learn the bo staff they go on to many other weapons in a proper order: nunchucks, short stick, then they go on to the broad sword, sometimes they go on to daggers, chain whip, and the highest state of weapon is the straight sword, called the jian. The Chinese martial artist values the straight sword as the elite of the elite in terms of weapons. And in my opinion the reason why this is is because back in ancient China, of all the modern-day weapons that were available to the ancient warrior, the straight sword was the most advanced form of weaponry of the time. I've been to the Bing Ma Yong, the Terracotta Warriors in Xi'an, China, and you can see that China was the first ones to bronze and chrome out their weapons, so that when they would go against an opposing army it was no contest! The chromed out steel weapon or bronze weapon is infinitely stronger and more modern, and therefore better at killing, than a futile weapon of the other countries at that time. But China has a tumultuous past, and many of those ancient warriors died out through the ages, through the millennia. And so in today's world, guns and bombs are the most advanced form of human weaponry. And so it blows my mind when a lot of human beings, especially in my social circle in America here, have guns, because guns should be valued as a weapon that is more advanced than even straight sword. 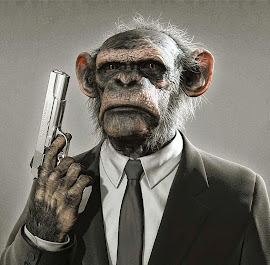 And so I feel that if you're going to own a gun, and use a gun in life, you should have to earn your keep by learning bo staff, nunchucks, stick, dagger, broad sword, chain whip, sai, etc., etc., on up the chain, and prove your worth to get to the gun level. And the reason why this is important is because when you are able to buy the most elite weapon just because you give somebody money, and you now own a killing tool right in front of you, you don't have any of the discipline, and the focus, and the training, that goes behind the responsibility of owning a killing tool of that magnitude. So I'm curious right now, what do you guys think? In the comments down below, tell me your thoughts. Do you think that anybody should be able to get a gun, the "most modern form of killing" in today's age? Or should a gun owner have to prove themselves with horse stance, empty-hand fighting, grappling, stick fighting, bo staff fighting, chain whip, dagger, and on up the chain, and then, when they're a 5th Black Master of whatever style that they're studying, they have a ceremony, bow to the teacher, and the teacher presents them a certificate of mastery, with a gun on top. Because now you have the focus, training, determination, and responsibility that goes behind owning the gun. Because if you guys are like me, the more skillful the martial artist that you meet, the better the fighter that you meet, the martial artist with more deadliness in their hands and more training in their experience, is usually the most responsible with that training possible. I can't tell you how many gun owners are so proud of their guns, they want to show them off to all their friends all the time. Well, I'll tell you what: a martial arts master doesn't go into their friend's situation, into a social situation, and show of all their punches and kicks and throws and grappling, OK? They're humble about it, and they keep their killing abilities safe and humble on the inside. I think gun owners should do the same thing. So tell me in the comments down below what you guys think. I really want to know what you guys think. Hit 'Like', subscribe to my channel, and get yourself the training, because as martial artists, we have to prove ourselves on up the chain, from empty-hand, weapon, to ultimate killing tool, because if we don't train, we won't have the responsibility and the focus needed to handle a weapon of that magnitude. Thanks for watching guys. I can't wait to see you back here for our next video, and also on any of my social media, like Instagram, Facebook, and Twitter. 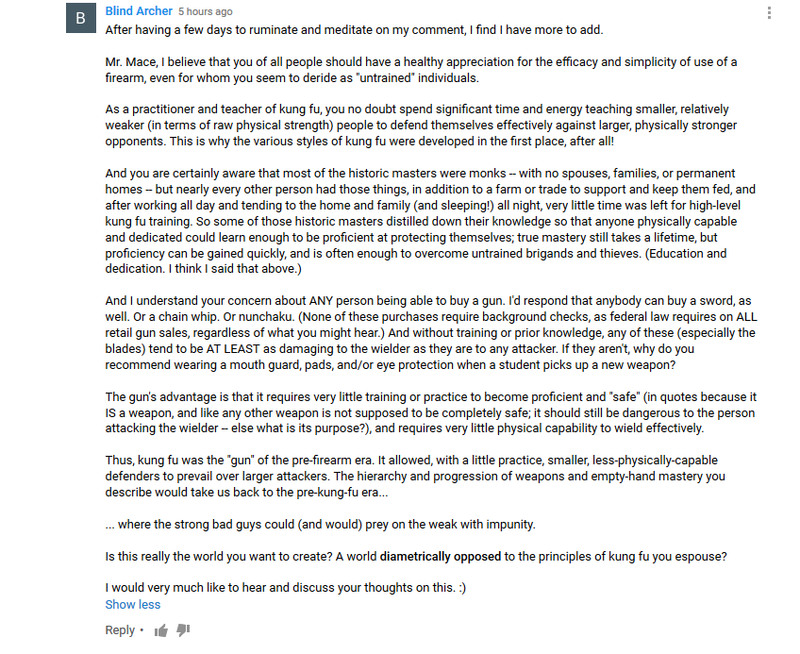 In short, he's OK with you having a gun for self-defense, but only after you've also trained for a couple decades in empty-handed defense and a plethora of traditional martial arts weapons (bo staff, nunchaku, three-section staff, butterfly sword, broadsword, chain whip, straight sword) to develop your focus, discipline, and humility** the exact same way he has. Then, and only then, would he "allow" you to own a gun. Needless to say, anyone older or more frail, or who doesn't have time or money to devote several hours of every day — for several years — to training (read: anyone with school, a job, life, or family), need not even apply. The Carol Bownes of the world, who need a means of self-defense right now, are equally on their own. 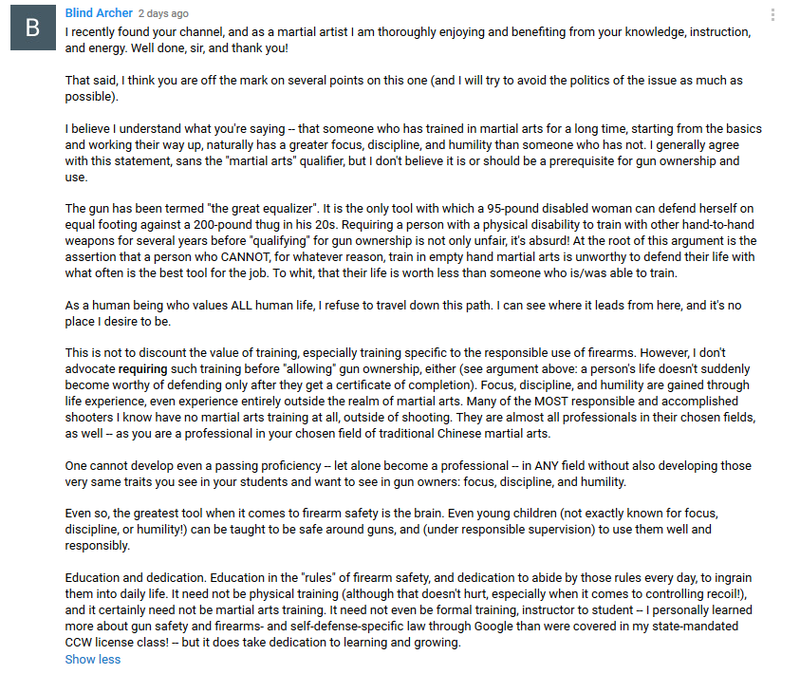 In his mind, the prerequisites of gun ownership — focus, discipline, and humility — can only be learned via martial arts. So if you instead chose to spend your child- and young-adulthood in school and college and earned an advanced degree in a STEM discipline, learning skills like logic, advanced mathematics, critical thinking, analytics, etc., you still don't have the focus or discipline to own a gun. Nope, you don't know kung fu, so even though your life's work keeps his lights on, keeps his car running, and — oh, yeah — keeps the spectacle of the Internet alive so that he can continue posting videos ... you aren't worthy of owning a tool to defend your life. There's a word for this mindset: elitist. It's a basic "might makes right" mentality. If you don't already have the might, you never will. 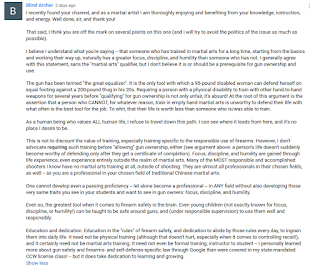 What's interesting to me is not only how devoted he is to elitism and "might makes right", but also how far off he is from the very principles of kung fu he professes to teach. Taking kung fu as a tangible skill, it is very much like a gun: a smaller, less-physically-strong defender can prevail over a larger attacker, or even several attackers. Often, just the difference in carriage — the confidence and posture with which the intended victim moves — is enough to deter an attack even before it starts. The defender doesn't even need to be a "master"; in many cases, mere proficiency is good enough. If you feel like leaving your own, maybe you'll have better luck getting through YouTube's insanely stupid filter. Stay safe, and don't give your money to charlatans pretending to be experts. * - Wow. Writing out that transcript and putting [strong] tags on his emphasized points makes him sound even more off-base than I originally thought, and that's saying something. ** - We won't even get into how "humble" a person could be, when they make their living showing off on YouTube. Because I hate wasting good material at an away game. To expand on a comment left at this post at The Captain's Journal, to whit, that the reason for big push for wealth redistribution — that invariably guts the middle class — is to burn the generational bridge between the poor and the elite. All wealth redistribution schemes benefit the elitists, either directly or indirectly. What they don't get from the middle class, they get from the poor when the poor spends what they get from the middle class. Either way, the rich get richer, the middle class is made poor, the poor get poorer after enjoying a (very) brief windfall, and the path to real wealth is destroyed, effectively turning America into a caste society. You've heard it said, "Never let anyone tell you nobody wants to take your guns." While true, that's not the whole story; they want your wealth and everything you've earned or made for yourself and your family, too. They want it all. And as with anything they use the government to get, they'll send men with guns to demand and enforce it. That is the reality behind wealth redistribution, and why it must be resisted at every step. I suspect St Loo did something similar to LA: they cooked the books. Years ago, the Los Angeles police refused to take reports of crimes, claiming a non-existent budget shortfall as the reason. To no-ones surprise, crime did dramatically decrease - in the reports. Murders were a bit harder for the pencil-whippers, as it was difficult to ignore all those nasty corpses leaking all over the place. LAPD, affectionately known as LAP Dogs, had to report that murders were higher that period. The Chief at that time failed in his bid to become mayor, but soon became a much loved and corrupt inner city city councilman. Here in the Loo - Chief Dotson was quick to blame it all on the official whipping boy of failing gubermints everywhere: Itz da guns! Dotson also attempted a run for mayor, largely on his record as a "crime fighter." However, the hard-left city board of aldermen vowed to fire him from his top-cop job if he ran. He quit the race. He'd have been a poor choice for mayor - the other likely candidates are worse. Is it legal or illegal for a state employee to carry a licensed, concealed firearm into state office buildings? DAS policy #125-06-321 seems to have disappeared off the Interwebz. Perhaps it has been rescinded? Other agencies have enacted their own agency-specific "no weapons" policies to replace it. The Department of Administrative Services, at the direction of Governor Kate Brown, has adopted a policy prohibiting all state employees from having a licensed firearm for self defense on "all property and facilities owned, leased, rented or otherwise occupied by the Oregon state government including grounds, buildings, parking structures and lots, vehicles and other equipment and any site where an employee enters on behalf of the employee's employment with Oregon state government except for an employee's home (including employees who live in state housing)…"
Apparently either the Oregon Department of Administrative Services did not learn from its past mistake, or they are getting pressured by the Brown Administration to re-enact anti-gun policies. But is it a legal policy, as in "supported by applicable law"? Further analysis below the fold. This sort of thinking always astounds me. It essentially boils down to "I felt safe when only people willing to break the law were carrying concealed, but now that anyone who is willing to be photographed, fingerprinted, and background checked can legally carry, I suddenly feel like I'm in danger." If they felt safe then, they ought to feel safe now. If they don't feel safe now, then maybe they ought to realize that their previous feelings of safety were just a comfortable illusion. Yeah, I don't understand the mindset, either. This kind of cognitive dissonance can only happen when people let their feelings override their rational thought. [I]f your arguments in favor of amnesty are as potent as you think they are (and you must think they're potent, because, like Obama, you seem to think the only possible objection is racism and hatred), why not actually share them with the group? Doesn't trust you enough to share where they really stand. Doesn't trust that you won't overreact and/or get violent if you happen to disagree. Doesn't believe you are worth discussing important issues with, as fellow adults. Doesn't feel they need to earn your support (but still feels entitled to it). At the end of the day, doesn't respect you at all. Basically, it comes down to politicians telling their constituents, "I believe what I believe, for the reasons I believe it … which I'm choosing not to share right now … or ever. Because I say so*!" Y'know, as if we're small children. That's not how mature adults interact with each other. Suffice it to say, that's absolutely not how elected officials should be treating their voters. Something to consider this election season. Vote accordingly. * - "… and if you don't agree, you must be a [insert personal insult, probably an '-ist' word]!" Over at Bearing Arms, Jenn Jacques has a post up about "compromise" with Democrats on "gun control". So if Democrats want a compromise, here it is: follow every single gun law currently on the book. Punish criminals to the fullest extent of the law. Ensure convicted felons serve their entire sentence. Only give second chances when the guilty have served their debt to society. While I appreciate the point she's trying to make, my answer to this would be, "No." I agree that there are already plenty of "gun control" laws on the books, and the government should be enforcing each and every one (otherwise, what's the point of having the law?). However, the "enforce existing laws" stance is not "compromise". That's just how it should be. "Compromise" is giving up something to get something in return. If Democrats want to compromise on "gun control" laws, our response should be, "OK, what 'gun control' laws are you offering to repeal in order to get the new laws you want?" If the answer is "None," then it's not a compromise. If the answer is "None, but maybe we won't go as far as we want," that's not a compromise, either. In neither case are the Democrats required to give up anything. Give something, get something. That's compromise, and that's where the debate should start. Sorry, Jenn. You're a bit off the mark on this one. It's been two months, and it's happened again: a Muslim with links to the Middle East, radical Islam and terror organizations has killed on American soil. Forty-nine innocents have died, with a like number injured. The Administration, Progressive politicians and the media immediately lept to the attack - not against this new, emerging threat, but at their old, bitter blood enemy: the Nation's gun owners. Politicians and activists sprang before the cameras demanding their usual nonsensical "common sense" nostrums with well practiced ease. They scrupulously avoiding more than a passing reference to the fanaticism at the attack's core. Our feckless leader whined about being criticized for never using the words Radical Islam - while still never actually using the words Radical Islam. However, he's very definitive about the unconstitutional secret gun ban list and reviving the ineffectual Clinton assault rifle law. Hillary danced through the blood to slam her opponent for supposedly "engaging in inflammatory, anti-Muslim rhetoric that made the country less safe." <unqoute> She also waved the bloody shirt at gun owners and the NRA. The media has gleefully hyped the tragedy, incessantly scoring the Orlando attack as the largest gun massacre. They're refusing to provide the context of the Paris, London and Russian attacks. They're also completely ignoring the largest night club massacre, where an immigrant used just a single gallon of gasoline to immolate 87 victims; it just doesn't fit the narrative. And Orlando wasn't even near the toll of the largest American mass killing. The Left's long running hoplophobia is in full flame: They're trying to make sweeping changes based on this one tragic incident that is thankfully extremely rare. Nonsensical "common sense" solutions, are flying around at the speed of opinions. The left is intent on destroying the Enumerated Rights of hundreds of millions of Americans in the demonstrated ridiculous hope of keeping arms from jihadists who are supported by terrorist organizations able to span the globe. After all, the terrorist in Paris had no trouble getting fully automatic AK-47s for their attacks. It's going to get worse - much worse. The Administration, Progressive and media attacks will escalate. As will the terrorist attacks. We will very likely need our weapons exactly when they are being threatened by the left. Fight the threat that the administration is importing, assisting and enabling. Fight the threat that political correctness will not challenge. Fight the madness that the Progressives will allow destroy us. Ensure that our political leaders still retain enough backbone to first for the Constitution and the citizens. Join the NRA. Fight for our future. Fight. By the way: the largest American mass murder we mention before? That was at Wounded Knee, South Dakota, where 150 men, women and children of the Lakota Indian Nation were murdered by the US Government. The attack came shortly after the Lakota's were disarmed. Something to think about.